Discussion in 'Whatever' started by Biff, Dec 29, 2013. OK - It's that time of year. What is the best thing in toyland that happened to you in 2013? It can be a new toy or sculpt, finally scoring that elusive grail, an exhibit or show, whatever (so long as it is toy related). What gives, no responses Biff? I'll bite...I had two members here truly help me out scoring two vintage clear grails. First eldorado, who hasn't been here in awhile sold me a nearly perfect Bullmark Triple Fighter clear, and then boo velvet traded me for a clear Popy Kikaida which had been pretty elusive for some reason. Both were much appreciated. Toy Karma exists. ...the fact that people actually read Art Whore, let alone the many many artists who continue to contribute. ...i learn more and more from each interview and post, and it's such a joy doing it. Finally taking a class taught by Itokin Park. I finally found some toys that I trade away 7 years ago. I thought I could find them easiy which was a big mistake on my end. Finally after searching nearly every day for them, I bought them with the generosity of a friend helping me out. A weird relief to be able to stop hunting for these after so long. Proper grail material for me. ^^ Not to mention, being able to get your own creation made as a Japanese toy. So what's the secret Michael, do we get to know what the replacement grails were? yeah, getting a toy made of my design is definitely just the best experience ever, toy related or otherwise. replacement grails were the hideshi hino zigoku kozu zombies- which i found to be limited to 50 each color and only sold at movie theaters or a horror convention, my found info was poorly translated a bit. but i will be happy to have them with me again. Mine was getting KFHC mentioned in Hyper Hobby! mine was getting employed full-time again so that I could finally come back to this expensive hobby. It's great to be back on the boards, but I have to say, I've been living in DC and I miss the camaraderie of the toy community in Chicago and around Rotofugi. It feels like a much more solitary pursuit here. Congratulations for the toy (link?) and for the grail too, very very nice. For me it was finally getting to the point I can trade/sell toys I still like and want, which has been very hard for me. It's been cool getting to move toys along to other members who wanted them enough to make a post about it, so I know the toys are going to good homes even if I will miss them. I also got to pick up a custom GID biter from PK at Grasshut. 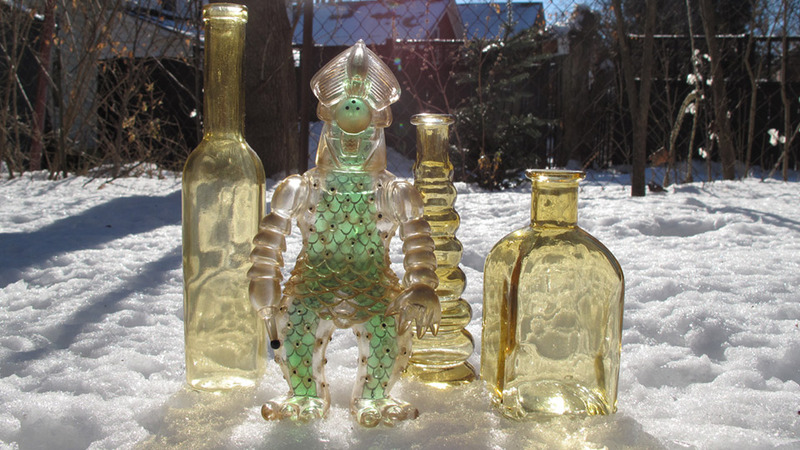 I wasn't expecting to be able to afford anything at the time and have only been able to attend a few toy shows over the years, so it was nice to be able to buy a toy from an artist directly, which I think is one of the joys of the indie sofubi scene. Best Toy experience of 2013? Hanging out with the friends I only get to see at conventions is always a good time. Making new friends through this hobby. Getting to collaborate and work with said friends on interesting projects. picking up 2 new unpainted marble skullwings this year. My best toy experience was my first SDCC this year and physically picking up my first exclusives. Also the same con that I picked my my first favorite toy, the Obake Dog. A second close is DCon. Putting faces and personalities to some of the names on this board was a great experience, as was getting to meet a lot of artists at both cons. Best thing in Toyland that happened to me in 2013 was when I had the opportunity of entering a raffle for BLObPUS Mockbat, and being notified I won my first Paul Kaiju toy! No grails or massive hauls. But yesterday, for the first time in ages, a mail day got me jazzed enough to lie around in the snow and take some photos. Reminded me to enjoy what I have and try not to get hung up on what i don't. Hope 2014 is packed with more toy excitement for all. Those DBM photos are just fantastic.